There are many reasons you may be experiencing fatigue and depleted energy levels. From chronic health conditions to vitamin deficiencies, there are plenty of reasons to be concerned about poor energy levels. It’s important for individuals to take control of their body and find helpful solutions to their personal energy deficit. This can be difficult, and a doctor can help you rule out many compromising health concerns. But don’t give up! Improving your energy levels doesn’t have to be just a dream; make it a reality by trying some of the following options. If you suffer from chronic low energy, you know far too well how difficult it can be to keep your energy levels up. Your body is fighting against you as you try to heal and feel better. You know that the low energy levels you’re experiencing aren’t what other, healthier individuals experience on a daily basis. What do you do in order to help replenish your low energy levels? Metatrol, manufactured by American BioSciences, is proprietary fermented wheat germ extract (FWGE). It helps to improve metabolic functioning and regulation, which in turn, can help to boost your energy when you need it the most. FWGE works on the cellular level and can help improve how your body uses oxygen and glucose at the mitochondrial level. 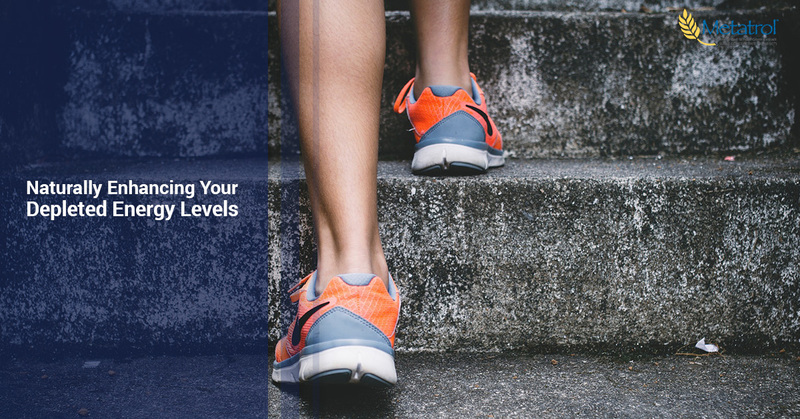 Getting active isn’t always the easiest thing to do when you don’t feel well and your energy levels are already low; however, finding ways to improve your activity level can have a cumulative positive effect on your overall energy levels. If you have a very low activity level currently, starting with a gentle 15 minute walk could make a difference. If you have a light activity level, perhaps a half hour of yoga every other day would be the perfect fit. The more you are able to get moving, the better you will feel. There are many different factors that can go into low energy levels, but a common one is some form of vitamin deficiency. While our bodies don’t need a lot when it comes to vitamins and minerals, you still need the appropriate amount to function. Some of the most common vitamin deficiencies that can affect your energy levels happen when you don’t get enough B12 or D3. These vitamins are critical in helping you to maintain your energy, so consult with a doctor about the proper amount that you should be consuming in order to boost your energy and avoid deficiency. Along with supplementation, addressing your diet is another easy way to boost your energy levels when you feel low and depleted. The saying, “You are what you eat,” holds true in many ways. If you opt for a diverse, healthy diet, you’re going to feel a lot better than if you opt to eat heavily processed foods full of sugars and fats. Opting for fresh, raw fruits and veggies with whole grains and lean proteins are going to help you truly feel your best. Stress is probably one of the hardest issues to address when it comes to your energy levels, yet it’s also the one that can have a big impact without you even realizing it. Stress very quickly saps your energy in an attempt to keep your body functioning and fighting against the negative effects of day to day life. If you reduce your stress levels, your body can use that energy for more productive processes and provide you with a more stable reserve when you need it. Along with all of the above, staying hydrated is key to maintaining good energy levels. In this fast-paced world, you may end up dehydrated without even realizing it, which can have a profound effect on your energy. If you stay hydrated consistently throughout the day, you’ll feel more alert and have more energy to spare. Metatrol is the best fermented wheat germ extract on the market that can help you to regain lost energy. You don’t have to feel depleted all the time when you turn to American BioSciences for help. Pick up a supply of Metatrol today to get started and experience the benefits for yourself.